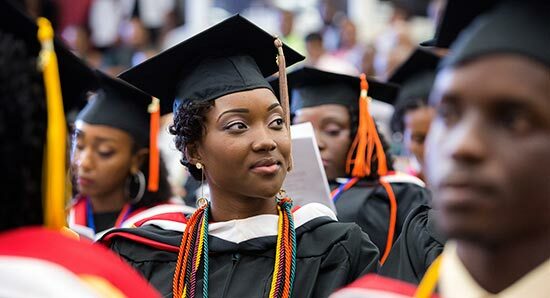 Nearly 400 students from 32 countries congregated at Patrick Adams Hall on May 14 for the annual Commencement Ceremony in Grenada. While they have different backgrounds and come from all over the world, the students from all four SGU schools leave the University well equipped to serve as future leaders of their communities. In the School of Arts and Sciences, more than 190 undergraduate degrees were conferred and included Bachelors of Arts (BA) and Bachelor of Science (BSc). Degrees were also conferred on over 80 School of Graduate Studies students from, 86 students from the School of Medicine, and one DVM graduate who joined the Grenada graduation. The remaining SOM and SVM 2016 classes will graduate at Lincoln Center in New York City next month. “Go forth and lead. We’re expecting great things from you.” That was the message from keynote speaker, Mr. Jason Roberts MBE, former UK Premier League and international football striker. Mr. Roberts founded the Jason Roberts Foundation in 2007 as his family’s way of giving something back to society through sport, with the aim of supporting young people, celebrating diversity, and promoting respect across communities. In addition to being keynote speaker, Mr. Roberts also received an Honorary Doctorate of Humane Letters from St. George’s University, along with fellow recipients Marion Greasley-Pierre, Executive Chairman of the Queen Elizabeth Home and creator of the SGU MD student orphanage interaction program; and Bertha Pitt-Bonaparte, a well-respected and valued member of the SGU community who formed the SGU Chorale, which provides a platform for different groups with mutual passions for singing to come together in concert. St. George’s University’s Gamma Kappa Chapter of the Delta Omega Public Health Honor Society also welcomed two surprise inductees at this year’s ceremony. Unbeknownst to them, Dr. Charles R. Modica, Chancellor, and Dr. Calum Macpherson, Vice Provost and Dean of the School of Graduate Studies, were inducted as honorary members for their local and global service in the area of public health. The Honor Society has inducted exemplary graduates and distinguished individuals since its establishment in 2012.